What does worship sound like? Does John Coltrane’s epic album A Love Supreme count as worship music? How about Kanye West’s Gospel flavoured Ultralight Beam*, in which Saint Paul’s blinding on the road to Damascus is paralleled with West’s own working-through of what faith is? Or his contemporary, the Gospel-inspired Chance the Rapper (real name Chancelor Johnathan Bennett), whose latest mixtape Colouring Book features an electronic redux of How Great is Our God? All of these have sold millions, and sat lofty on musical charts, but will have certainly never graced the pulpits and pews of Sunday services. So, at what point does the music stop being worship, and became a purely creative act? 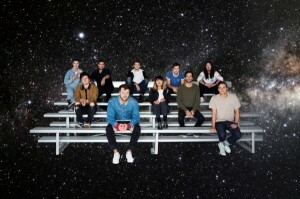 WONDER, the new album from Hillsong UNITED pushes what worship music sounds like. Heavy on effects, filled with samples, drums rolls, and even poignant use of auto-tune, the album is the most distinct the group have ever been. There is a musical quality that makes the album wholly distinct. These songs do not sound like anything in worship gone before. Other standout tracks are the infectiously upbeat ‘Not Today’, ‘Shadow Step’, the album’s thunderous and epic title track, and the incredibly simple ‘Life’ that strips back the lyrics to such an extent you could write the choruses and verses on a post-it note. The pun-titled song Rain/Reign, with vivid images and raining synth sounds and pounding drums, bears mentioning as a stand out track on the album. This is by harmoniously uniting its lyrics and sound into one moving song. But wait. Why even make a worship album that contains strange musical beats, jarring images, and retro auto tuned voices and synths in the first place? But only does God’s creation deserve seeing with eyes of Wonder. With effort, we can forget what we have received in forgiveness. How do we go back to that childlike faith once held? This is where, for me, the retro-synth sound of the album comes in. WONDER sounds retro because the past is where our own wonder lingers behind. If we travel back in time to find a forgotten sound, there we may find a simple faith once again. All in all, the changes on WONDER serve to prove the point that worship is not a genre. It’s not a sound. It’s a re-adjustment, setting our eyes on the greatness of faith. What divides WONDER from the music mentioned before is that whilst they undeniably are concerned with faith, with God, and with what belief means, it never extends beyond their own faith. Coltrane’s striving to repeat the beauty of the Psalms in Jazz, Chance the Rapper’s faith through heritage, and Kanye West’s looking for the “light” are all expressions of faith from a human perspective. The same way the perfect song on a summer’s night can paint a new world in your eyes, Wonder strives to see the world through God’s eyes. To cut through the petty, small, and trivial hangups humans are uniquely effective at getting stuck in. WONDER is not just worship music, then. It is also the eyes through which we should approach faith, in awe of the world, in awe of Christ’s sacrifice, in awe of God. WONDER by Hillsong UNITED was released on 9th June, and can be ordered here. *Whilst Kanye West's Ultralight Beam does look at faith, it does require a warning due to its strong language. The same applies to the majority of songs by Chance the Rapper.